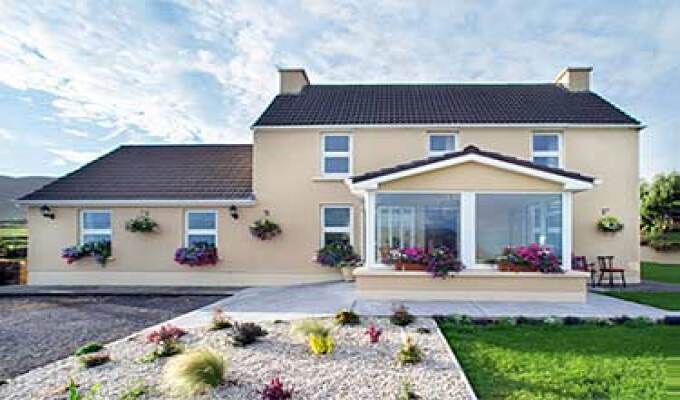 Situated on the panoramic Slea Head Drive at the western end of the Dingle peninsula. We are under the shadow of magnificent Cruach Mharthain, on whose slopes David Lean constructed the mythical village of Kirrary, for his film Ryan's Daughter. All rooms have private bathroom facilities. Panoramic sea and mountain views from bedrooms. Guest Lounge for relaxation with wide screen TV. We are only a short distance from the famous Three Sisters / Na Triur Deirfear and Sybil Head / Ceann Sibeal landmarks and only a few paces from the secluded sandy beach - Clogher Beach / Tra Chlochair. 10km from Dingle / An Daingean and 2 km from the Gaeltacht village of Baile an Fheirtearaigh (Ballyferriter). Wonderful stay at nearly the westernmost tip of Europe. The B&B is situated in walking distance from hiking trails and a little beach and a 5 minutes drive by car to the town of Ballyferriter. We had a very nice room overlooking green fields, and our hostess there made us feel really welcome. A huge, tasty Irish breakfast or alternatively a lovingly prepared fruit dish in the morning, tea and scones, cookies or cake in the afternoon, sitting in the glassed in veranda which let's you enjoy the view. At our next stay in this part of Ireland we will definitely return to Ceann Sibeal. I had an excellent stay here. The owner, Aine, gave me additional sausages and bacon for breakfast each morning as I did not have the usual other items. She also made some toast on the one wet afternoon I had and even washed some of my clothes; nothing was too much trouble for her. The accommodation was comfortable and well placed for what I wanted to do. I would recommend this B&B.